It was back in 1996 when Anna Maria started her journey into music. After a brief stint working as label manager for BMG Greece, she quickly moved to KLIK FM, which was at the time the highest rated radio station in Greece. Her preference in dance music, soon moved her to the weekend slot where for the last 6 years she puts people in a clubbing mood every Saturday and Sunday from 22 to 1 at night. The show being a reference point to all dance music lovers, has brought her in contact with some of the greatest djs in the world who usually stop by for a quick live set before their gigs. Even though the radio has always been the number one priority in Anna Maria’s work life, she has occasionally flirted with television always doing shows dealing with all aspects of dance music, the last one of which being a three year stint at Mad tv every night, presenting Heineken Zone, a show introducing all that was new in dance music , as well as interviews with international and local djs. That was where she met her husband and father of her daughter, G.Pal. During all these she found the time to hold a weekly to monthly residency at Greece’s premier dance club, +Soda, playing sets ranging from tibal/tek house to progressive. During those nights she made a point of introducing the “new talent” slots giving the opportunity for the first time in 2001, to young aspiring djs to try their luck in the booth of the infamous +Soda. In 2002, right after the release of G.Pal feat. Anna Maria X- "Ocean Of Blue", a lot of things started happening together. First of all the track found its way to some of the greatest djs in the world sets, like Sasha, Digweed, Creamer and K.. Saeed and Palash. 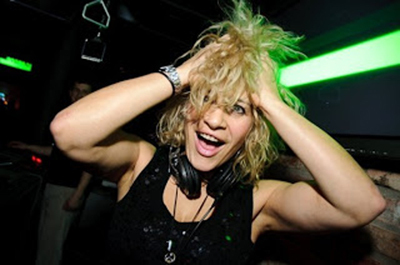 At the same time she released her first mix compilation AMX-Believer, which reached number 4 in the official IFPI sales chart, was awarded “best female dj/performer” in the Athens Dance Music awards, and together with G.PAL secured a residency at the fast rising Lithuanian dance scene as the first woman to ever play there. At that time she took a break for a year to have her baby girl, and then she was back with a vengeance, releasing Believer 2 and currently being in the studio with G.Pal recording new monster tracks, due out on Swift Records. 2005 started with a new GPal and Anna Maria X collaboration, a downtempo track called “Within” featured in Dave Seamans new compilation series called ACROSS BORDERS on Audiotherapy. In 2007 Anna Maria X releases her first compilation Sleepless Drive. for Klik Records. It was immediately great accepted by the club community since it included the hottest tech house and progressive tracks of that moment. It's big success lead to the sequel so from July 2009 and on, Sleepless Drive 2 is in every updated music lover's cd player.